Use freeze dried fruit and there is no need to add extra sugar. The oatmeal will be crunchy and sweet. Because the fruit is freeze dried the fruit maintains its vital nutrients and vibrant flavor. The oatmal mix is shelf stable, a healthy option and no refrigeration is needed. ■ Try adding your favorite chopped nuts, or a 1/2 scoop of protein powder to any of these varieties. Use Pint glass canning jars to ensure that you will have room for your liquid & stirring. The photo shows 1/2 pint jars that were assembled for my children using smaller 1/3 cup portions of rolled oats. 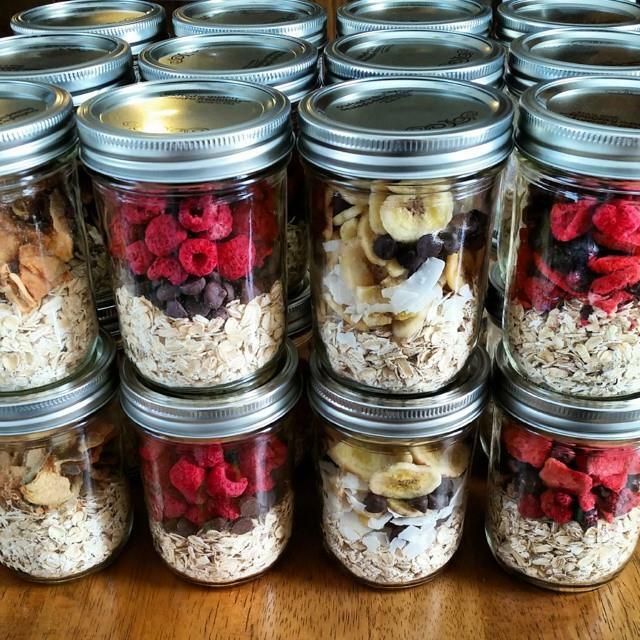 ■ Add 1/2 cup dry rolled/old fashioned oats to the bottom of the glass jar. ■ Add your favorite flavor combos. ■ Seal tightly, and store in the pantry until ready to use. ■ Pour 1 cup BOILING HOT water, or milk (unsweetened almond, coconut, or cashew milk are favs at our house) into each jar. ■ Let sit for 10-20 minutes(depending on the consistency you like), while you finish your morning routine. ■ Grab a spoon, and enjoy on-the-GO! On this day 90 years ago the Harlem Globetrotters played their first game in Hinkley Illinois (right outside Chicago) Abe Saperstein founded the team after he took over coaching duties for a team of African American players. The team was originally called Savoy Big Five. African Americans were not able to play in the pros. The team was named after the famous neighborhood of Harlem in New York City. The racial makeup of the team was promoted and the Globetrotters to make is seem as if they had traveled around the world. Saperstein came up with red, white and blue uniforms. The globetrotters participated in the World Professional Basketball Tournament on a yearly basis. In 1940 the Globetrotters was the big winners of the tournament and the team also started to participate in on court antics. Juggling acts and over the top shots were just a few tricks that they would participate in. Saperstein told the players to continue in the antics as long as they had a lead in the game. 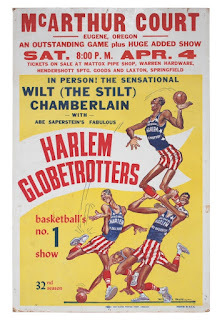 The globetrotters would beat the Minneapolis Lakers in 1948. The NBA had just formed and a few years later black players were being allowed to play. This was the first year that Saperstein would compete for his talent. The talent and antics of the globe tropics would continue and become an international sensation. 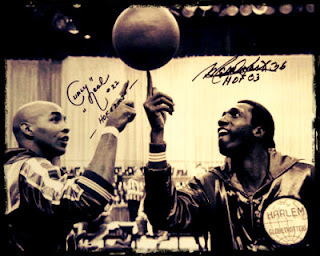 The Globetrotters have had stars with talent like Wilt Chamberlain, Meadowlark Lemon, Curly Neal and more . The team has played in more than 115 countries in front of millions of fans. There have even been cartoons based on the Harlem Globetrotters. Prepare gravy per instructions or warm up leftover homemade gravy if you have it. Cut the roll in half and spread each side with cranberry sauce. Layer with warm stuffing then turkey. Cover with gravy. Enjoy! Took the family out the other day for breakfast and what did more than 1/2 of them order?? Nothing else than their favorite biscuit and gravy. I tell you though the best I have ever ate will never be duplicated and I can not have any more because it was from my husbands grand-mother who passed nearly 15 years ago. 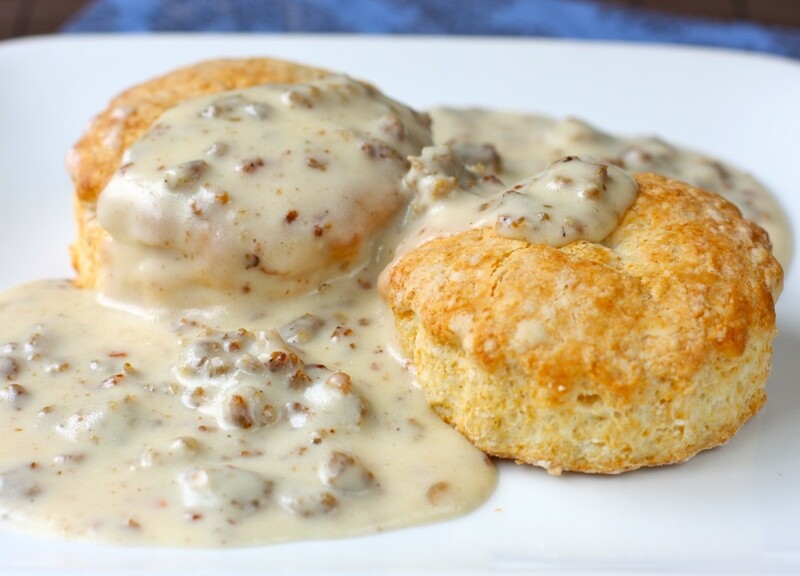 While dishes like biscuit and gravy are awesome to have they should not be enjoyed daily. They have a tendency to be a bit heavy. So most times I try to make them at home because if we are gonna eat em then they might as well be delicious and enjoyable. It seems that every grandma from the south has their own biscuit recipe. Many have been handed down through generations. Some may still call for lard while others call for shortening or butter or a combination. Using more will result in a flakier biscuit but more butter makes it richer as well. Some recipes call for self rising flour others add their own leavening agents to all purpose flour. Grandma used to use all purpose flour and buttermilk, and when she had it she would use lard otherwise it was shortening. Be careful not to overwork the dough or roll it to thin or the biscuits will be a bit tough. 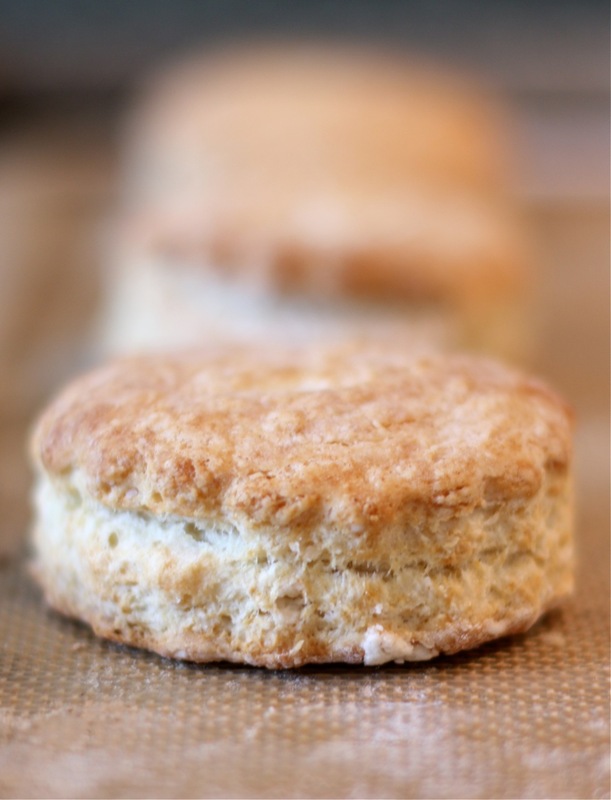 Biscuits should be light, fluffy and flaky. Preheat the oven to 450°F. In a bowl, sift together the flour with the baking powder, baking soda and salt. Using your fingers or pastry cutter, work in the lard just until the mixture resembles coarse meal. Stir in the buttermilk just until moistened. Turn the dough out onto a lightly floured work surface and knead 2 or 3 times. Carefully roll out or pat the dough, about 1/2 inch thick. Using a 2-inch round cutter, stamp out biscuits as close together as possible, without twisting the cutter. Transfer the biscuits to a baking sheet. Pat the dough scraps together, reroll and cut out the remaining biscuits; do not overwork the dough. Pierce the top of each biscuit 3 times with a fork and brush with the butter. 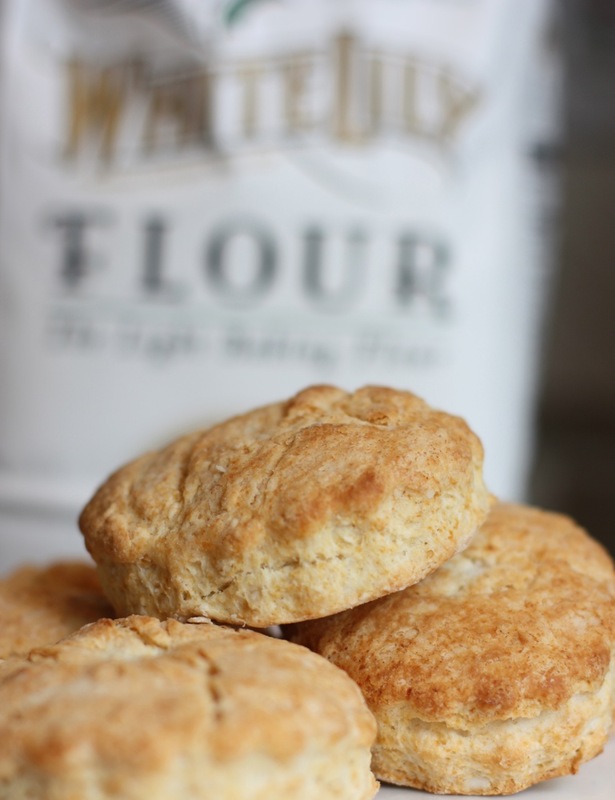 Bake the biscuits until risen and golden, about 12 minutes. Add in the eggs, mixing well after each egg. Add in the vanilla and mix again. In a separate bowl, mix together the dry ingredients. Add to the sugar mixture in thirds, mixing well after each addition. Fold in the crushed candy canes. Drop by spoonful onto a greased cookie sheet. Bake at 375 degrees 12-14 minutes. Transfer to cooling rack. Temps in southern Illinois are frigid. No one wants to go outside but there are those of us who must work. For those that don't cold winter days are best for cuddling up and hibernating. Most years you will find January 6th in the middle of winter and old man winter up to his tricks. Perhaps that is why January 6 is the unofficial cuddle up day. Pets make perfect cuddle mates as well. Perhaps you simply want to cuddle with your warm blanket in a big comfy chair and have some alone time. There is no right or wrong way to cuddle on this day. My favorite person to cuddle up with is my precious grand-daughter Princess. We are lucky enough this day and age to be able to enjoy citrus year round. The truth is though that there are many varieties that are at their peak of flavor in the winter. Clementine oranges are at their best around this time of year. They are super sweet, juicy, naturally seedless and easy to peel. Clementines are delicious on their own or in desserts but there are even more ways to use this delicious fruit any time of year. 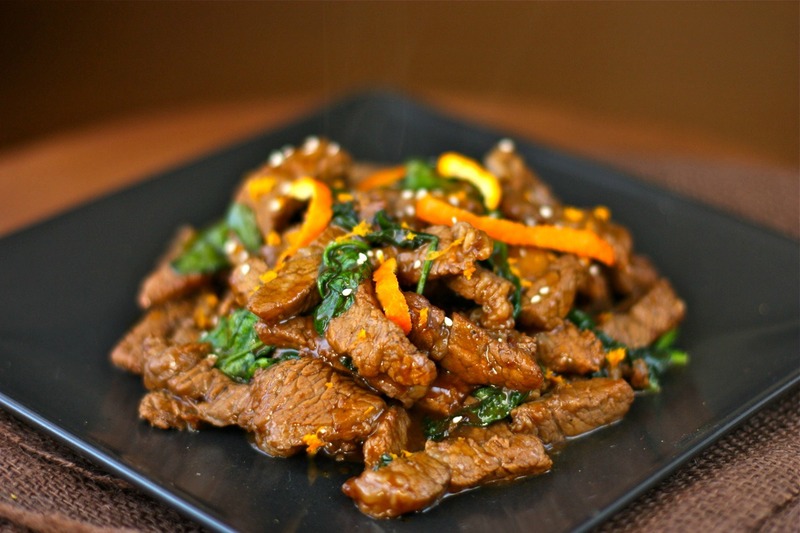 In savory dishes like the one I share here the sugary tart flavor of the clementine compliments the salty and spicy taste of this stir fry. 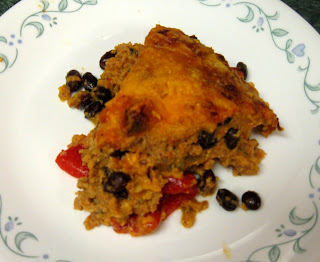 The recipe can be changed and adapted to what you have on hand or/and in the mood to eat. You can also substitute tangerine or orange for the clementine. You can add more vegetables such as broccoli, snap peas, bell peppers, green beans, bok choy or green onion. You can also select the level of spiciness according to your taste. You may want to make a side dish of rice to go along with the abundant amount of sauce. Have you ever stepped on a lego, toy car or other toy in the middle of the night or hurrying to the bathroom.? Ask any parent and they most likely will agree that the pain involved with these little plastic bricks. Have you ever smashed a small plastic toy of your child's?? Some are so cheaply made and shatter into tiny irreparable pieces. 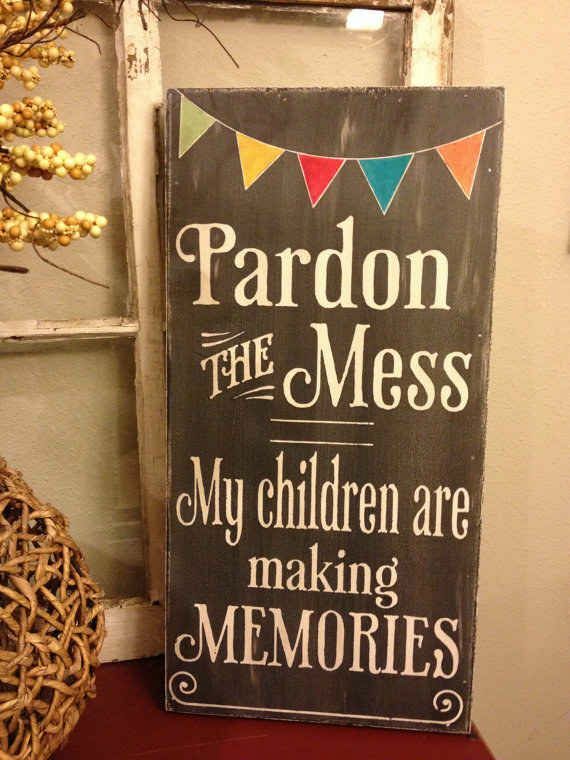 I have tried to explain to our grand-children that they need to take care of their stuff and be responsible. If you have ever had this conversation with your children then I wonder if you also have felt as if at times you are talking to yourself. Leaving things on the floor and toys getting broke means that the problem of not picking items up off the floor is getting serious. It may be a problem of not knowing how to organize the mess and since they are children they need a leader and clearing a whole room may seem like a rather large task to them as well. You can actually make this a bit easier for your home by using a few simple tricks. Organize all toys into like categories. Put all the cars in the same place, the dishes in another, whatever it is your child plays can be broken down into different themes. When our children were younger we tried to set it up in themes. Store toys in bins, baskets or boxes whatever works best. Dish tubs, inexpensive totes, and laundry baskets are all winners for both the ease in keeping items together as well as on the pocketbook since these items are all available at the dollar store. Everyone including our children could use a bit of simple in their lives. Sometimes they just simply have to many toys. At different times through the year I sit down and go through the toy boxes sorting out what they play with and what they do not. Any broken toys are sent to trash while those that are simply not played with are often donated. You may find out what you find in the toy box from missing shoes to that empty juice container I have found a bit of it all. If the fact is that they simply have too many items then ask relatives and friends not to give toys for their birthday or holiday but rather offer them a experience to make memories. Taking a child to the zoo, museum, movie, or other fun place will offer them a bit of fun that they will not soon forget. Older children may be interested in games, music or video on the internet. There are many to choose from that require only a few dollars that your child will love for hours. Mix together the brown sugar, eggs, butter and vanilla. Mix until blended. Mix together the remaining ingredients, except the chocolate chips. Add the flour mixture to the egg mixture and stir until everything is mixed well. Fold in the chocolate chips. Pour into a greased casserole dish and bake at 350 degrees about 20 minutes. These were so unbelievably good! So the holidays are over and instead of waiting for the warm weather to return why not start planning. Start planning what you may ask?? Well how about gardening you know fruits and vegetables. Growing your own fruit and veggies to cook and eat are great and if you like flowers why not plan a flower garden. Growing a garden can help you save money, help you live better and possibly a bit of extra pocket money as well. Have some extra space?? Why not plan a community garden to meet your neighbors. Gardening can help you save money by helping you cut the grocery budget. Keeping a gardening journal can help you keep tract of your savings. The journal will also help remind you what you need to buy or not buy the following year. Gardening can help you live a sustainable life. Gardening is beneficial and friendly to the environment as well. Earn a bit of extra income from your garden by growing enough for your family and a bit more. You can sell at the farmers market or even by helping others with their garden. Bringing together neighbors is sometimes hard to do but it may be done through a community garden. A garden requires work and working together can also spark conversation. Gardening requires work but also can be a source of relaxation. Tending to the garden can bring about a unique appreciation of nature. The tranquility of gardening can bring you closer to your neighbor, your family, mother nature and yes even God. So what will you grow in your garden. 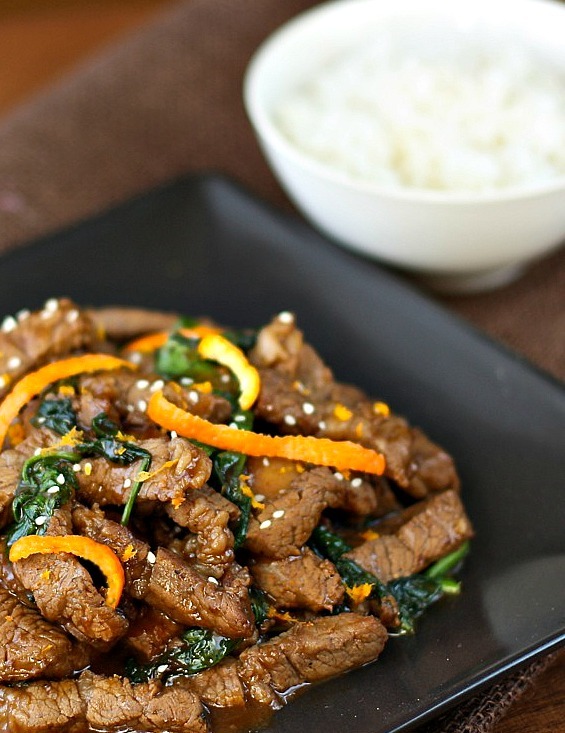 This is a rather easy dish to prepare. It provides your family with a cheesy spicy meal that is also great comfort food. Preheat oven to 375. Spray 10 in. pie plate with cooking spray and line with red peppers. Scatter 1/2 cup cheese on top of the peppers. In large bowl, mix 1/2 cup cheese, ground turkey, 3/4 cup salsa, beans, bread crumbs, eggs, parsley, salt and pepper until just combined. Press into the pepper and cheese lined pie plate. Spread the remaining salsa over the top. Bake for 40 minutes. Scatter remaining 1 cup cheese on top and bake for 15 minutes longer. Let cool 10 minutes before slicing. It may sound funny but bird collisions are the most frequent cause of bird deaths. Do you share to prevent such collisions by putting up window decals or window feeders to alert birds to glass. Another danger to birds are unleashed dogs and cats. My own animals have been known to get their selves into trouble by hurting wild life whether it be a rabbit, squirrel or bird. Plastic trash bags present danger to birds you may mistakenly eat them. This may cause them to become ill or even die. 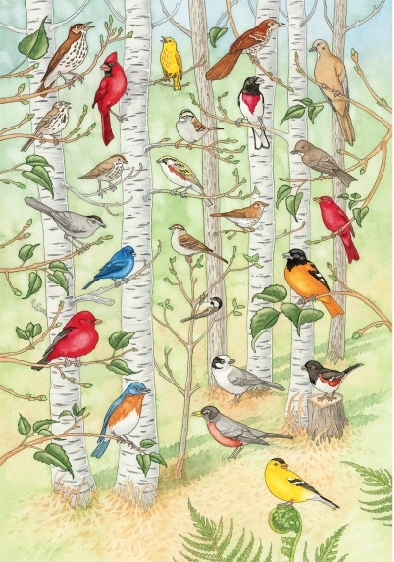 get out and enjoy the birds and where they live in nature. 20. Learn the Hunting Laws - Federal and local laws protect sensitive areas and manage the harvest of birds to ensure healthy populations. Place all ingredients in a large bowl and beat slowly until sugar is combined. Then turn beater on high and beat until stiff peaks are formed, about 2-3 minutes. Serve whipped cream over fruit or any other dessert. 1. Place apples in a 3-qt. slow cooker. In a large bowl, combine the brown sugar, flour, oats, pudding mix and cinnamon. Cut in butter until mixture resembles coarse crumbs. Sprinkle over apples. 2. Cover and cook on low for 5-6 hours or until apples are tender. Serve with ice cream if desired. Yield: 6 servings.